"Do we really want to travel in hermetically sealed popemobiles through the rural provinces of France, Mexico and the Far East, eating only in Hard Rock Cafes and McDonalds? Or do we want to eat without fear, tearing into the local stew, the humble taqueria's mystery meat, the sincerely offered gift of a lightly grilled fish head? Bourdain I am not, but I do fantasize about being as gung-ho. The truth is there are some many things I have yet to find the courage to eat. The legendary balut, crispy grasshoppers and those belly-dancing sago worms top my list of scary things to have in the stomach. This, I can handle (points below). 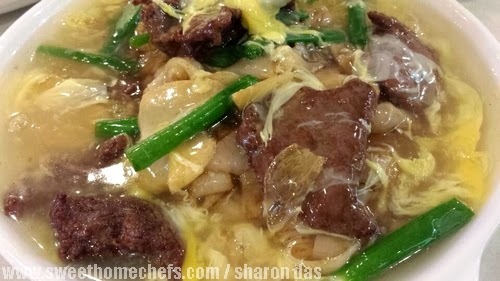 Wat Tan Hor is a popular flat rice noodles dish in Kuala Lumpur, served smothered in egg gravy with either seafood or beef slices on top. Can it sound any yummier? Yes, it can ... with ostrich meat. Delicious is how I'd rate this version. I never realised how tasty ostrich meat is until I tried this. This was cooked to tender perfection. I had another food-first when I flew home recently. 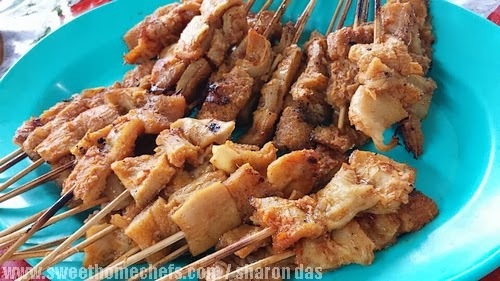 I was introduced to beef tripe satay - berubut, as the locals in Labuan call it. It began with my cousin's adamance that we order a plate of 'berubut'. The word, alien to me, sounded like something that I should run far, far away from. I kept my fears in check, in line with Bordainism but I did it by thinking about ice-cream and chocolates. When I realised it was beef tripe, I heaved a sigh of relief. It tasted really good and is easy to bite into despite its rubbery look. I guess I don't have to conquer anything too challenging just yet, not when there's so many great stuff I haven't eaten that sounds more appealing such as mille crepe or bacon brownies. Mmmm..mmmm! Life is short ~ make it sweet. Looks colorful, I have never eaten this before but I would like to try it. I have had Beef Tripe Satay before and it is good! When you travelling you must try the local delicacies. Not those fast food chain. Hahaha. I dont mind the ostrich meat but I pass the beef tripe satay. Lol.